Congratulations to B4 employee of the Quarter Diane Janerico! 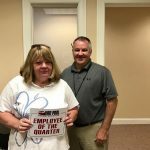 Home » News » Congratulations to B4 employee of the Quarter Diane Janerico! Congratulations to the B4 Employee of the Quarter Winner Diane Janerico!!! Thank you for all that you do. Keep up the good work! 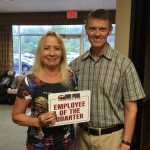 Congratulations to B2 Employee of the Quarter Peggy Baldyga! Congratulations to B6 Employee of the Quarter Ann Bressan! !